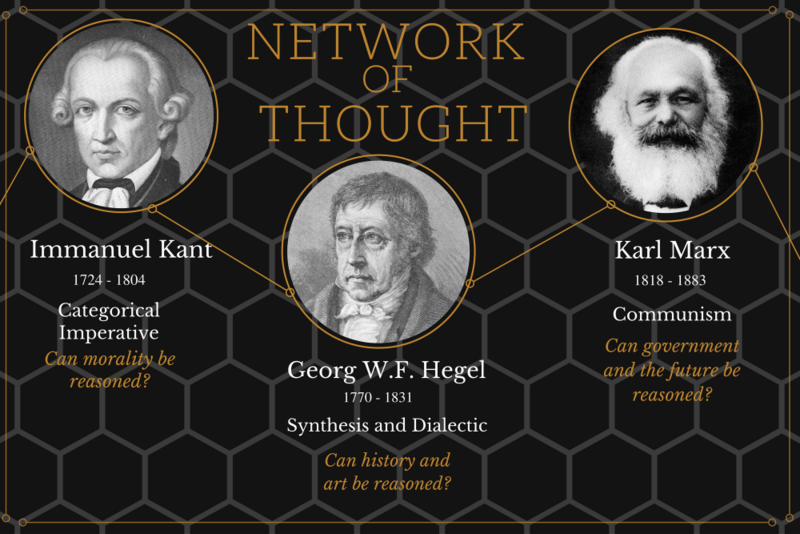 This image, inspired by Collins’ work mapping intellectual networks, shows the impact of Immanuel Kant’s ideas over intellectual descendants like G.F. Hegel and Karl Marx. Image created by Tom Cohen. To understand where ideas come from and how they evolve over time, sociologist Randall Collins mapped the networks of 3,000 philosophers and mathematicians, a yeoman project that took him on a 25-year journey across the globe, seeking insights into the histories and inner workings of societies and the thinkers who shaped them. More recently, Grant Oliveira, a data analytics consultant with an interest in the origins of philosophical thought, embarked on a project to corral the universe of philosophers that exist on the web, namely via their Wikipedia profiles. That project—which took about two weeks—yielded flawed but promising results. Looking at these two projects together—one the product of decades of deep gathering of ideas, the other the harvesting of crowd-sourced data—provides some interesting contrasts that in themselves shed light on how ideas are born and perpetuated. 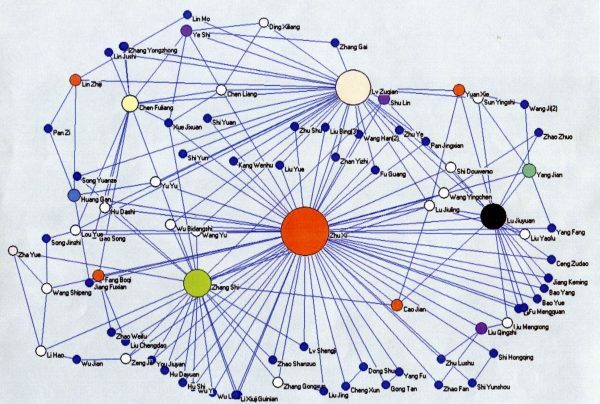 For Collins, his personal networks influenced the project. Early in his career he worked with an Israeli professor, Joseph Ben-David, who was studying the origins of modern science. His mentor explained how the German research universities created the model imitated by England, France, and the U.S.
Collins researched the networks of Islamic thinkers in the 8th through 12th century. Courtesy of Randall Collins. “I had been a philosophy student before sociology so I was interested in people like Kant, Fichte, and Hegel, and I knew they were connected in a network,” Collins said. “As I read more about it, I realized these were the leaders of the revolution to upgrade the medieval university into a research university. I had also studied the social history of the world religions. 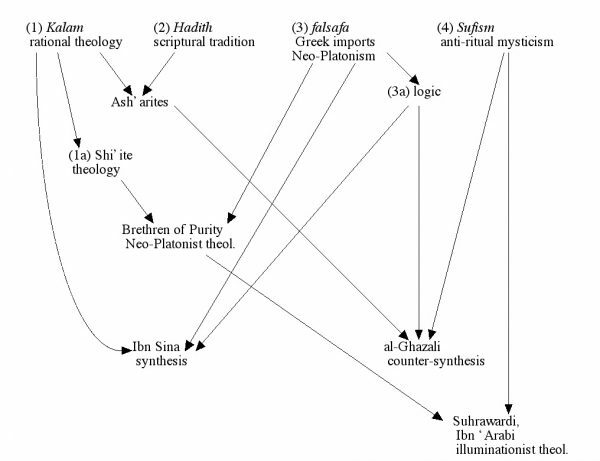 Collins map of the relationships between philosophers in 11th and 12th century China. Zhu Xi, the philosopher represented by the red dot in the center, is the most influential scholar of the Neo-Confucians. Oliveira used Wikipedia to create an algorithm to identify philosophers, the era that they lived in, and the networks they were part of, including who influenced them and who they influenced. Because some philosophers on Wikipedia may have additional or alternative categories, he acknowledges that this network is not authoritative and has some weaknesses. An interactive version of Grant Oliveira’s “Philosopher’s Web”. Click the 3 dots on the left to expand. For optimal experience, view on desktop or open a new tab here. Tom Cohen is an editor at the Berggruen Institute.